In less than three months, I will be participating in my second Pan-Mass Challenge - the largest charity bicycling event in the country. I will be raising money for the life-saving work being done at Dana-Farber Cancer Institute. I will be cycling a total of 192 miles over two days – from Sturbridge to Provincetown - as a returning member of the Patriots Platelet Pedalers team. Proud Fact: We were the largest overall team and the second highest fundraising team last year. The unfortunate truth is that I don't know a single person who hasn't been affected by cancer in some way - a family member, a friend or themself. Fortunately, we are seeing remarkable advances that are leading to early diagnosis, effective treatments and models for future cures. I want to play a role in supporting those advancements – so I ride. 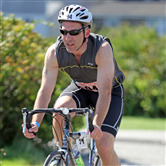 I hope you will consider supporting Dana-Farber through a donation to my Pan-Mass Challenge ride. 100% of PMC rider-raised revenue will directly support the Jimmy Fund and Dana-Farber Cancer Institute. AT PMC, they like to say we're getting closer to a cure by the mile. That's true. However, we simply cannot cross the finish line without the help of a peloton of supporters. Thank you for your consideration. PS. Thousands of individuals will ride in the Pan-Mass Challenge on August 4 and 5. If you are already supporting one of those riders, thank you!